DIGITAL MARKETING Three ways anyone can start reaching more customers right away! Learn about website and SEO, internet marketing channels, engagement and click metrics, optimization, email marketing, & digital funnels. Admission includes (1) beer or wine, sodas, heavy appetizers. 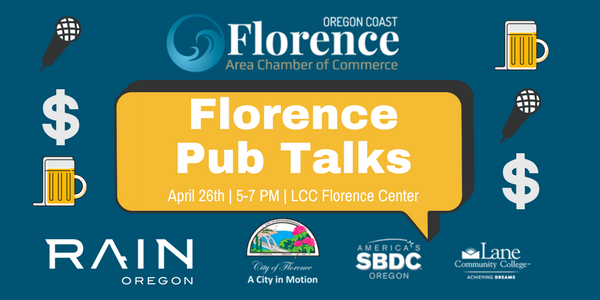 Pub talks are sponsored by the Florence Area Chamber of Commerce, RAIN, SBDC, and LCC to help equip and promote new and existing business growth and sustainability.